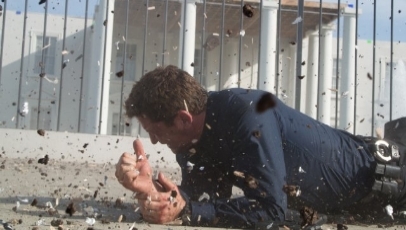 After years of being miscast in laughable rom-com’s opposite such talentless faces as Katherine Heigl, Gerard Butler rediscovers his calling with Olympus Has Fallen, a performance that reminds us of why he broke out in the first place. It’s a shame, then, that the film itself doesn’t match up to its stars surprisingly shipshape standards, often falling short to cheesy dialogue, annoying patriotism and an overstretched running time. Mike Banning (Butler), a former Presidential aid, is left disgraced and cast aside after a freak accident ends in a brutal death. However, when the White House is infiltrated by a North Korean terrorist organisation and the President (Aaron Eckhart) is held hostage in the underground safe room, Banning is called upon to retake the White House and, more importantly, avert a potentially devastating nuclear attack. The first of two films released in the same year to feature a terrorist attack on the White House (the second of which, White House Down, follows in September), Olympus Has Fallen shares many similarities with Die Hard, yet ultimately lacks the coherent narrative and urgency that made that film so wildly entertaining. Instead, it often plods along which, when the running time clocks in at a draining 120 minutes, doesn’t do itself any favours. The narrative here, which was so obviously rushed through by first time screenwriters Creighton Rotherberger and Katrin Benedikt, is unrealistic, paper thin and riddled with inconsistencies (the security system within the White House doesn’t appear to have changed in the time Banning has been absent). It may hinge upon an everyman’s efforts to stop a terrorist attack, yet the characterisations are so cliched and situations so ludicrous that there’s very little for the audience to invest in. Butler may be an enthusiastic player (he delivers a suitably adept performance), but there’s only so much he can do to paper over the cracks. The supporting cast, an array of Academy Award nominees including Melissa Leo and Morgan Freeman, can’t quite overcome the shocking dialogue they’re forced to deliver, and Antoine Fuqua’s threadbare direction makes the film look like a direct-to-DVD Steven Seagal effort. There was potential here for Fuqua to deliver a culturally relevant action romp (it ties in nicely with the threats of war currently being made by North Korea) for audiences to lose themselves in. Unfortunately, despite awarding Butler an opportunity to prove himself once more and providing some of the most cringeworthy one-liners in a long time, Olympus Has Fallen succumbs to the most obvious of problems from the unnecessarily drawn-out opening sequence and never recovers.